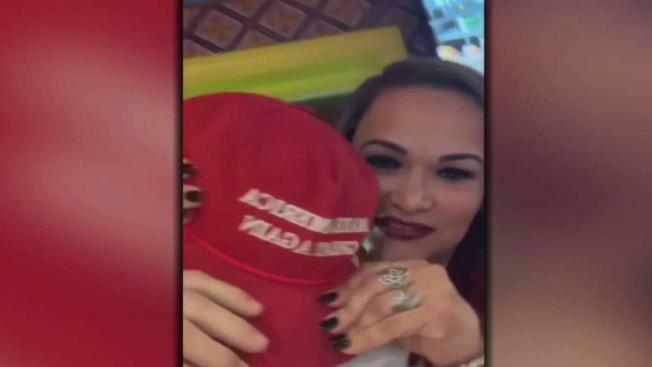 ICE officials say Rosiane Santos is "an unlawfully present citizen of Brazil"
A woman charged with assault in an incident over a "Make America Great Again" hat could lead her to be deported. A Massachusetts woman who allegedly assaulted a man wearing a Make America Great Again hat at a restaurant in Falmouth is in custody of U.S. Immigration and Customs Enforcement and due to be deported. Authorities said Rosiane Santos, 41, is "an unlawfully present citizen of Brazil." "Santos is currently facing local charges for assault and other offenses. She is presently in ICE custody and has been entered into removal proceedings before the federal immigration courts," read a statement from John Mohan, a public affairs officer for ICE's Boston office. Santos pleaded not guilty last week in Falmouth District Court to charges of assault and battery and disorderly conduct for an incident the evening of Feb. 15. Police said they were called to the Casa Vallarta on Davis Straits Road, where Bryton Turner had been minding his own business when Santos began to verbally assault him due to the MAGA hat he was wearing. Turner began to record the incident with his phone saying, "Ignorant people like this. I'm just trying to sit here, eat a nice meal." In the video, Santos can be seen walking up behind him and pulling the hat off his head. Court documents show when police asked Santos why she did it, she said it was because he supports President Donald Trump and she allegedly called Turner an expletive. "That's the problem with America these days. People are just ignorant. They want to lash out on people who are educated," Turner said in the video. Police said when Santos was arrested, her eyes were "bloodshot and glassy". While walking her out of the bar, she allegedly hit Turner in the head. Santos had been released on her own recognizance but was then taken into ICE custody Tuesday.